Rather dull weekend of Formula One action kicked off in the same way as Bahrain with protestors overshadowing the racing spectacle all the way through. But the excitement was back on when countdown to Qualifying reached its brimming point. With the last four races won by the four different pole sitters Qualifying turned out to be key element of success despite Canadian GP having a bad reputation for it. Redbull’s hole in the floor was deemed illegal by FIA after late investigation and were imposed to modify wheel hubs claiming they gain performance out it. Lewis Hamilton headed up the charts on both Thursday session on course for a third pole but Vettel was right up there along with Alonso. A three-way battle heralded its coming when Vettel topped FP3 earlier today. On the slippery surface at Circuit de Gilles Villeneuve – hardest on the brakes this year – race to the grid positions went off in style. First set out was Rosberg following his fuel connector failure in FP3. In the earlier part Kamui Kobayashi slithered off to the wet grass surface nearly ending up on walls and so did Sergio marking his tyres on the ‘wall of champions’. Q1 intensified right from the start as both Force Indias headed out to lay out some fresh rubber and they were quick in the low downforce track. Then arrived the usual pack of combined front and mid-field runners perplexing on difference in nature of pirelli compounds with track temperature around 24 deg C.
Many drivers chose to run Super Softs at the closing stages amongst which was Jean Eric Vergne. Despite finishing in race conditions his qualifying pace left him as unlucky number 18th along with usual bottom six. His attempts to improve from 20th got one better but messy last run put him no further than 20th on the grid behind both Caterhams of Kovaleinen and Petrov. The Frenchman reported lack of pace in his car unlike his team-mate Ricciardo and felt nervous through corners locking up on regular intervals. Heikki missed the final chicane bouncing off the kerbs lucky not to get damaged down the Wall of Champions. Marussia reported concentrating on race after Pedro de la Rosa beat Glock and Pic stayed ahead of Narain Karthikeyan for 23rd. Time for elimination of another seven in the 15 minutes Q2 session. Super Softs had been applied on most drives to set quicker laps excluding Ferrari who tried out on Softs in their first run for Alonso but only lasting a few laps. Lead changed hands promptly between the top three teams as around 1:13sec looked good for pole. First out on track was sole surviving Toro Rosso of Daniel Ricciardo followed by Alonso and Kobayashi along with Perez. Rosberg went fastest ahead of Kobayashi in his initial run. Meanwhile, Hamilton went few tenths quicker than Jenson for P1. Alonso aborted his first run having went off the track and Massa had put on some decent laps in. Hamilton split the Redbull pair for second with eight minutes left on clock. Alonso down to last but recovered to deliver p2 – only a tenth down to Vettel. With a couple of intense minutes to close out, Massa fell back to p11, likewise, Raikkonen was at p14 while Di Resta went for a flyer to g0 p7. Hulkenberg clung on to p10 ahead of Grosjean with Raikkonen holding onto p10. But Massa lapped in eighth quickest to put Kimi in the drop zone ahead of Button and Kobayashi. 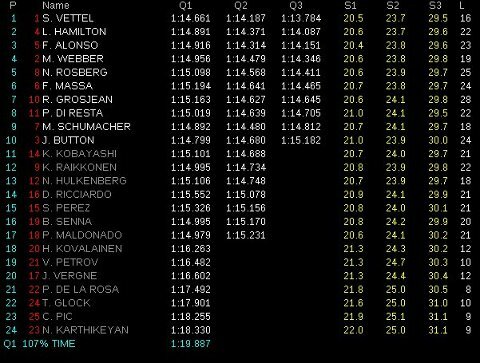 Grosjean saved his day with p7 which meant knocking Kobayashi out. Button’s woes meant that he stayed out in the garage leaving Pastor Maldonado to crack the code. Sector 1 fastest time in his final lap but ended up prey for the familiar Wall of Champions when exiting final chicane – clouting the kerbs with more speed making a dramatic spin. Jenson Button had front tyre lock up which evolved from practice having damaged his lap times. Kimi Raikkonen had a crucial differential issue which impeded him to go full throttle and also no more fresh set of Super Softs available for him for tomorrow’s race. The decider towards achieving pole position got underway as Lewis Hamilton, Fernando Alonso and Sebastian Vettel were clear favourites. The Mclaren duo back out on track; Button going a step further in the process as Lewis made some mistake. Rosberg had the momentum shift in his favour until Grosjean and Massa swapped p1 ahead of Schuey and Alonso. Hamilton on 1:14.439s to grab the top provisionally before Vettel made his visit into 1:13.905 leaving the rest of the field aching. Just in time, Alonso was the next man out hoping to get his first pole since Singapore 2010 but he was two tenths down to Vettel. Another run from Vettel saw him a further tenth up, 1:13.784s clearly snatched him second pole of the season with a stunning display of committed driving . Webber on his final flying lap stepped up from p5 to p4 about six tenths down to his team-mate ahead of Rosberg and Massa. Romain Grosjean’s Lotus would start ahead of Resta. Di Resta had a splendid qualifying – aborted his q3 run but finally back on track to beat former world champions at p8. Schey might’ve felt annoyed by Alonso hampering his final run languished at p9 ahead of rather lucky Jenson Button. Vettel clinched the pole three tenths from Hamilton and only a second and half separating the top fifteen runners put us on a place for an exciting race. Teams will try to exploit a single set of tyres to run through the race and prefect balance from front to rear in the right operating window could put them in a better position to challenge for victory. Sebastian Vettel’s 32nd pole came from the place his team had never won before and he stay par with Nigel Mansell in terms of number of poles in only his 87th F1 race compared to 187 starts of the great Mansell. Can Vettel sprint away or follow the tactics to burst at the final stint ? Or will it be the usual surprise circus in Canada ? Montreal has a classic race in store for sure.